"I want the freedom to be able to listen to that which is coming, the freedom to embrace that which is new"
"Maestro, maestro!" 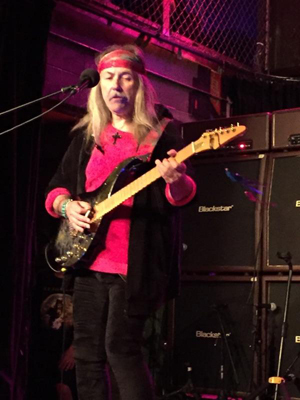 the early-bird faithful are imploring Uli Jon Roth, on an Easter evening, from the front of the stage at Reggie's Rock Club in Chicago, where they have patiently perched waiting to glimpse the master-shredder conducting his sound check. 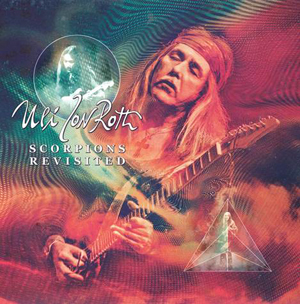 Truly venerable in the innovation of the heavy rock guitar sound, particularly in his neo-classical and even transcendental work with the early SCORPIONS and solo, Roth, nevertheless, remains less well-known compared to some of his ground-breaking peers, like Blackmore, Page, and even Schenker, but that is because he had a uniquely intense imperative to follow his creative muse, most often at the expense of broader commercial success and fame. 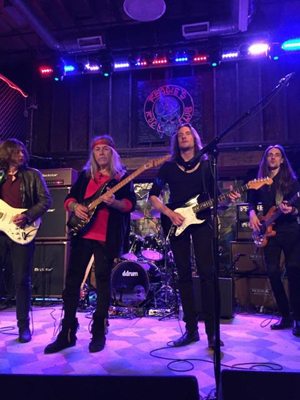 And he certainly appears to be more quietly humble than most, too, as he casually mingles among his hard-core fans at the special pre-show sound check (that includes a special VIP jam with not only Uli, but also fellow guitarists on "The Ultimate Guitar Experience", Jennifer Batten and Andy Timmons). Despite this down-to-earthiness and accessibility, Roth remains the mercurial, mysterious maestro - what the imagination might conjure as a philosophical and creative cross between the [Salvador] Dali and Dalai [Lama]. One of an astonishing three genuine guitar virtuosos spawned by the SCORPIONS, Roth replaced Michael Schenker, who then replaced Roth briefly until Matthias Jabs finally took over for good. Like Michael Schenker before him, he too left SCORPIONS before their commercial heyday, and followed the road less traveled. But on the present day, though Uli was not aware he had an interview scheduled, it's all good to him, and even to go in depth. But then that might be expected because depth, rather than superficiality, is what Roth is all about. As we walk around to the back of the venue, it is pouring rain and Uli, good manners intact, wants to make sure we all have hoods or umbrellas handy, as he jokingly tries to direct us to each of three graffitied old buses in the alley behind Reggies ... before we turn a corner to the new and modern one where we go conduct the interview. Members of the tour band come and go in process, and Jennifer Batten grinds coffee [which Uli will later pour, noting, "This is my drug of choice"], while we talk about the current tour and much of what has gone before, and which has yet to come. We begin with the last time we did an interview, which had been 30 years earlier, also in Chicago. ROTH: I love the Metro! And you actually interviewed me there? KNAC.COM: Yes, and I know it was after the show, and it was the Beyond The Astrial Skies tour. ROTH: Yes, it was the Astrial Skies tour, sure. What do you remember of that show? I remember it was a big hall, and it was kind of packed ... and that's all I remember! (laughs) I remember one of our guys sitting with his girlfriend next to the stage, and I remember arriving in a cab, and one of my fans met me in the hallway going up, and he later became the booker for House of Blues. That's how we got the gig at the House of Blues - because of that guy. It's all coming back now..
KNAC.COM: Well it has been a little over 30 years. And I remember it being a great show, but not many more details, either. ROTH: Well, it was like a homecoming for me in Chicago. I don't know why, but it's one of these cities that seems to resonate the most with me, with the audiences. KNAC.COM: Well, in general, Chicago has a great many guitar connoisseurs. ROTH: It's the guitar thing probably; that's what it is! (laughs) That's so obvious, isn't it? I never thought about it that way! KNAC.COM: You're friends with Billy Corgan, and he's from Chicago too. ROTH: Oh, but that was much later, I think it was 2007. We were on a TV show together and we spoke about our favorite venues, and he said, 'mine would have to be The Metro' [in Chicago], because that was where he grew up. KNAC.COM: But in Europe, didn't he appear with you at certain shows? ROTH: Oh, yeah! Quite a few, actually. It was more like, I appeared with him! (laughs) You know? No, we did some really big shows together. They [SMASHING PUMPKINS] were headlining one of the biggest European festivals, which is Rock Am Ring, a 90,000 people festival, and that was the first time we played. During their encore, he invited me up, and I did not know the song, and we had a 20 minute jam on German prime time television, and it went really well. That was a real highlight. It was so enjoyable to play with that band - it was a great band. The drummer was phenomenal, Jimmy Chamberlain, a one man army! Billy is such a great improviser; it was just a lot of fun. ... And afterward, we did that several times, even in Glastonbury Festival. It's a very unusual thing that he does. KNAC.COM: It's beyond the box. ROTH: Totally! Oh, yeah, he loves to mess with boxes! ROTH: Exactly! We really have that in common. If it's a box, you gotta try to make sure it doesn't work, or we need to see what's outside of it, or make it bigger or smaller. You have to tamper with it. He understands boxes better than I do, so he tampers with boxes on a more conscious level than I do. KNAC.COM: I know you still live in England now, and this tour is you and two American guitarists, so how did it all come about? ROTH: I'm kind of touring the States regularly now; almost every year. And the last two tours I went under my own name basically playing the Scorpions Revisited program. But, at the back of my mind, I knew I always wanted to do a three guitar thing, with three like-minded guitar players, and do something of real quality. And, that idea was at the back of my mind for many years, and of course I had already toured a lot with various artists, and jammed a lot. But this one is a first for me. When it came to the choice of who to play with, it wasn't that difficult, because there aren't that many to draw from - in the first place - who would be suitable for this kind of thing. I thought about Jennifer [Batten] right away, because I knew she would be the right person for this. We had already toured a little bit in Italy and New Zealand. I watched her doing what she does, and hearing what she does, and I was very impressed with that. It was different from what everyone else does, and I totally respect that, when someone does something different. And yet there's a certain entertainment factor to it, and it's not boring. So, that was a no-brainer for me. ROTH: Andy was different for me because I had not toured with him, and had only heard him play one song at the NAMM show with Simon Phillips, but, a couple of years ago, some music school aficionado played me Andy's music, because Andy had just been there. And I thought, Wow, this guy is really, really good. So, that was at the back of my mind, and there are not so many players who really get to me. So, those two are the right ones, because I'm always looking for people who have the right kind of attitude, and you can jam on stage without destroying the musical foundation. That is easier said than done, because, not all guitar players are good at jamming! In fact, most of them aren't, at least according to my experience. So that was the whole deal there. KNAC.COM: I know you did, as you alluded to earlier, re-recordings of many of the SCORPIONS songs that you did with them initially, with Scorpions Revisited. ROTH: Yeah, these were all the early ones, the ones I was involved in. It was a cross-section of my favorites from that period. KNAC.COM: And, from what I've read, you are also working on something new? ROTH: I am working on something new. But the first thing that is going to happen is that we've also recorded a counterpart to that Scorpions Revisited, which is a DVD that was recorded live last year in Tokyo, in the same hall that we recorded Tokyo Tapes at - Sun Plaza Hall. It was recorded by Japanese television, and it came out really nice. KNAC.COM: When will it be released? ROTH: First in Japan, and then slightly later in the States and Europe. It's done, but not yet mastered, with surround-sound. The second thing, is that I am working toward a new album. I've written more than enough new material, and it's long overdue, and we're rehearsing some of these songs as we speak on this tour, during the sound checks, actually. And the VIP pass holders can attend that. That's a novel idea, and for me it has proven quite helpful, because we are rehearsing them much more than we normally would. Normally, I would go into the studio without rehearsing the songs and make it up as we go along. In later years, as you start to play them live, they take on a different persona, and very often the icing on the cake comes when you start to play them live. So, I thought, why not do them beforehand? KNAC.COM: How recently were those songs written? ROTH: I started the process in 2011 and a lot of them were written then or in 2012, and they've been resting since then. Having said that, recently I started looking at them again, and certain little bits and pieces hadn't been finished. Then suddenly the answers that I had been looking for were all there. So sometimes you have a song with question marks here and there, and you look for a solution, and sometimes it just takes time. A year later, you look at it fresh, and think, of course, that's what it needs. That process even happened to me with the SCORPIONS material, because there were some songs that didn't have an ending on the albums. They were just faded out, and whenever we played them live, it was never quite right. But now, with the Scorpions Revisited, I found an answer to every single one that I was very happy with! KNAC.COM: It's good to have that perspective. ROTH: Yes, yes. I can now do things I couldn't do back then. Back then, it was just all emotion, and impetus, and instinct. Sometimes it's good when you have a little bit more than that. And that comes with experience. KNAC.COM: Are the things that inspire you now the same as they used to be? ROTH: My inspirations have always kind of been different. I don't follow a set pattern. Every album is different, and even my working methods have changed all during my life. I'm not really a creature of habit when it comes to these things. I just let it flow. Everyday is new, and very often I would forget the way I used to do it. I think that's a good thing because I invent a new way every time around. I'm very happy about that, because it keeps it fresh. Personally, I think that if you have a methodology that works, I feel it could turn into a trap, where you become self-replicating over and over again, and I don't want that to happen. KNAC.COM: Where it becomes formulaic? ROTH: Yes. Every one of my albums has evolved really, really different from one another - to the point of nothing commercial -because normally an audience expects a certain kind of something. It's like, if you buy a Macintosh apple, you want a Macintosh apple. With me, you can have a Macintosh apple one day, and then the next day you get a plum or a Kiwi fruit. (laughs) And some people might say, I really want him to make another Macintosh apple. But I can only say, I can't do that. Even if I wanted to, I can't. They will say, "Oh, can you write another Electric Sun album?" And I say, I can't, because my mind is in a different place. Well, if someone forced me to as life or death matter, I probably could do it - somehow - but I don't want to. I want the freedom to be able to listen to that which is coming, the freedom to embrace that which is new. KNAC.COM: It's true. When you look at your catalog, there's no doubt you are difficult to pigeonhole. KNAC.COM: Well, it seems that Pandora has somehow pigeonholed you. ROTH: Oh, yeah? (laughs) What was the result? 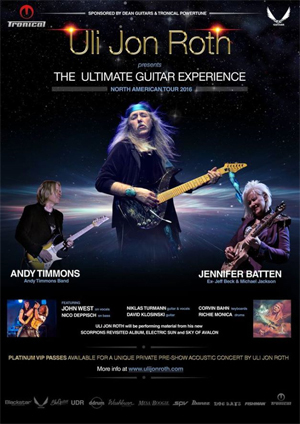 KNAC.COM: Well, it seems that the Uli Jon Roth station on Pandora has you in there with other well-known solo guitarists like Satriani and Vai. KNAC.COM: And also Jennifer! (laughs) She is definitely in there too. ... I know you still live in the UK - Wales really, which is very beautiful, but it is very remote from the music business. ROTH: Totally. But I'm not in the music business. I can do everything by the phone. If I want to be social, I would go to London and hang out with famous rock stars, but I don't do that. Very occasionally, only, when I get a direct invitation from someone I really like. So, I'm not networking in that way. I do everything by phone, or by the internet, so I could be in the wilderness. KNAC.COM: So are you pretty tech savvy? ROTH: Oh, yeah, I'm tech savvy, but not like a real computer nerd. Sometimes I wish I was! But, I totally embrace technology and I love it. KNAC.COM: Are you doing production and things on computerized formats? ROTH: Yeah. I also used to engineer a lot of stuff but I don't now, because I don't like to do it anymore. It's too cumbersome; I used to get bogged down in technical details to the point of insanity. I remember programming samplers for about a half a year to get orchestra recordings done, and, in the end, when I did it with a real orchestra, it was just so much better right away. So, nowadays, i would rather stay away from the physical aspect. When I record, I would make sure someone else handles pushing the buttons for me. KNAC.COM: Now, you have toured with Michael Schenker ... You grew up together, and have the SCORPIONS connection. KNAC.COM: Do you stay in touch with those guys? ROTH: Not with Michael! Michael you bop into every once in awhile, but he is not a person who is in any way socially inclined. Rudolf and Klaus are different, but even they are so busy that we usually do our own thing. When we meet, it's great, but we don't meet that often. The last time I saw Klaus for half a day was maybe a half a year ago, when we had some very long interviews together. And we get along just great; it's like an old marriage. When you have spent so much time together, in such close quarters, you really get to know the other person. And that's all good. I love those guys. But Michael - we're friends - but he doesn't ever get close to anyone, except some girlfriends or so. Michael likes to keep to himself. KNAC.COM: Yes, I know ... But that is history there. ROTH: Oh, yes, we have lots of history! Since he was 11 or so .... I guess I'm like 20 days older, technically. It goes back that long ... 1967 or 68, it was. KNAC.COM: And the things you've seen since then! But, as you said, you've been touring every year, so you're not even home much yourself. ROTH: No, no. The other year I did 110 shows, and about 25 Sky Academies, so this year I don't know how many it'll be. It might be less, but maybe the same; they're still lining up. ... I still enjoy touring, that's the good thing. Because there was a time when I didn't enjoy it. In the mid-80s, I got really fed up with it. So I stopped touring for 13 years - completely. I really got back into it because of the G3 tour [with Satriana and Schenker in '98]. KNAC.COM: Why didn't you like it back then? ROTH: It got on my nerves! You know, the shows were great, and I've always enjoyed the gigs and meeting the fans. But, back then we didn't have computers, and a lot of it was just wasting time in airports or in cars. Nowadays, I can work very well on tour, thanks to these gadgets. And also my mind works in a different way now. I used to be very much a perfectionist, and now I'm like the opposite. I'm just flowing ... and not having the feeling, when I'm on tour, that I'm wasting time. Because time is the most precious thing, other than health and relationships with other people. It is these three things. I really hate wasting time! For me, watching a television program, is like 99.999 percent time. And I can't take it! KNAC.COM: What do you do instead? Reading? ROTH: I love reading and I don't do enough of it! But I've got a really good book in my duffel bag right now. It's about the inner life of trees, and it's fascinating! It's unbelievable, actually. KNAC.COM: Do you know who the author is? ROTH: Well, the problem is that this book is actually written in German. I picked it up at a German book store and I don't think it's been translated. It's unbelievable. I love plants but I never really knew that much about trees, other than a touchy-feely way, like a "tree-hugging" type of person. (laughs) But this guy really knows trees from the inside out, and it's amazing how trees form communities, how they help feed each other through the roots, and how they warn each other, like when there's an insect attack and they start disseminating chemicals in the air to keep the bugs at bay, and that's only the beginning. KNAC.COM: Would you ever write a book yourself? ROTH: I have written books; I've written at least four. KNAC.COM: Are they available still? KNAC.COM: No wonder I didn't know! What are you going to do with them? ROTH: Good question, good question. I've ghost written one book, but I'm not going to tell you what that was. But I want to finish my stuff, I want to publish it, but first I'll have to finish them up in a way that I'm really happy with it, and I'm not yet.